ESC8000 G4 features a powerful GPU architecture that supports up to eight high-performance NVIDIA® Quadro® or Tesla® GPU cards in a 4U chassis. With so much graphics power, ESC8000 G4 lets you accomplish demanding computing tasks more quickly and with greater efficiency. An optimized internal layout enables ESC8000 G4 to fit a wide variety of graphics cards - including dual-slot GPUs - with active or passive thermal modules. ESC8000 G4 provides flexible system topology configuration options, including the ability to choose a single or dual root complex, making it ideal for deep learning requirements. The patented Adaptive Topology design enables users to switch the system topology easily via the intuitive web-based GUI of the ASUS ASMB9-iKVM server management solution, without changing any hardware configurations or cable routing. 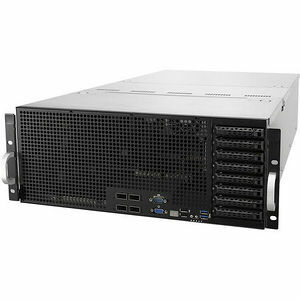 ESC8000 G4 is designed for easy scalability to fit growing businesses and workloads. With eight PCIe Gen3 x16 slots that fit full-height, full-length GPU cards, two PCIe Gen3 x16 slots for high-speed networking cards, and one internal PCIe Gen3 x8 slot for an HBA/RAID card, ESC8000 G4 is ready to deliver high-density, parallel computing power. It also features multiple interface types for flexible storage configurations, including dual PCIe or SATA M.2, and port-to-port dual OCuLink with Intel VROC technology for two hot-swappable 2.5" NVMe SSDs. ESC8000 G4 also fits up to eight 2.5" SATA 6Gbp/s HDDs or eight 2.5" SAS 12Gbp/s HDDs with an optional HBA card. ESC8000 G4 features an embedded ASMB9-iKVM module and is bundled with ASUS Control Center software to provide comprehensive in-band and out-of-band management. For more information, see the ASUS Control Center microsite. Cooling an accelerator server handling extreme workloads at up to 3200 Watts of power consumption is a demanding task, so ESC8000 G4 is equipped with hot-swappable, redundant fans and dedicated air tunnels for the CPU, GPUs and DIMMs. Ten fans for the GPUs - five primary and five back-up fans - plus two coolers for the CPU ensure nonstop cooling performance for nonstop server operation. ESC8000 G4 features ASUS-exclusive thermal radar technology with ambient sensors placed on the CPUs, GPUs and DIMMs. This design provides internal and external temperature monitoring and enables dynamic fan curve adjustment, lowering fan power consumption up to 20% and reducing TCO which is ideal for extreme workload data center. With the ingenious placement design, IT staff can swap key components with ease. ESC8000 G4 has three easy-access covers that can be opened without tools, enabling IT staff to perform maintenance on specific components without removing the server fully from the rack. ESC8000 G4 has a visible Q-Code/port 80 LED display LED for simple monitoring of the entire boot process, from power on through loading of the operating system. ESC8000 G4 provides instant system information during initialization as well as any unusual diagnostic results for more efficient IT operation and easy troubleshooting.